The Nevada Public Research Institute (NPRI) points out that, according to state law and an 1865 Supreme Court ruling, the control of federal land in Nevada is unconstitutional. Nevada legislators should sue the federal government, in concert with action taken by the state of Utah, it recommends. After a federal judge in South Carolina ordered the U.S. Department of Energy (DOE) to remove one metric ton (2,204 pounds) of plutonium from the Savannah River site by Jan. 1, 2020, the DOE began making plans to transfer the material to Nevada. Over the objections of Nevada’s leaders, the DOE approved a plan in August 2018 to ship the plutonium from South Carolina to NNSS. In November, the DOE sent a letter to then-Gov. Brian Sandoval about the transfer of material from Nevada to Los Alamos National Laboratory in New Mexico "or another facility" by the "2026-2027 timeframe." There are only four sites where this type of plutonium can be stored: Savannah River, South Carolina, which was never upgraded to properly contain the material; Los Alamos in New Mexico, Pantex Plant in Texas, and NNSS in Nevada. The DOE’s Office of Secure Transportation, the federal agency that transports plutonium, has transported it for decades, mostly without incident. Nevada sued the federal government earlier this year, seeking an injunction to prevent any plutonium transfer, but was overruled by U.S. District Judge Miranda Du, who denied Nevada’s request. However, her ruling came after the plutonium had already been shipped. "Nevada’s claim of irreparable harm to Nevada’s lands, environment and by extension Nevada’s citizens, is merely a theoretical possibility at this juncture," Du wrote. She refused to ban any plutonium shipments. 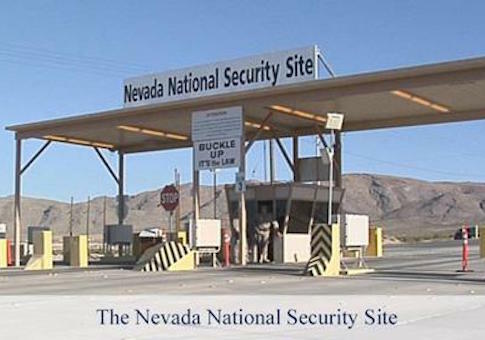 Nevada appealed the ruling, requesting the 9th Circuit Court of Appeals to order the government to remove the plutonium. In the meantime, state Democratic Sen. Catherine Cortez Masto continues to block appointments to vacant positions in the DOE until she receives a letter in writing stating when the shipment will be removed, she says. And Gov. Steve Sisolak wrote to Secretary Perry, saying, "I am beyond outraged by this completely unacceptable deception from the U.S. Department of Energy." But the governor and senator have little-to-no jurisdiction over what the federal government chooses to do on federal land, according to the U.S. Constitution, NPRI points out. But that federal land is unconstitutional to begin with, it argues, pointing to an 1865 U.S. Supreme Court ruling. In its Solutions, a Sourcebook for policymakers, NPRI argues that Nevada "must review the constitutionality of federal action." It also recommends that Nevada follow Utah’s example, which created a standing legislative subcommittee to review the constitutionality of federal action. NPRI points to a state statute signed into law by Gov. Bob List in 1979 (NRS 321.596‐321.599) stating that federal control of 87 percent of the lands in Nevada is unconstitutional, sparking what became known as the "Sagebrush Movement" in western states. In 2011, Utah Gov. Gary Herbert signed HJR 39, calling on Congress to transfer control of many public lands to the state. In 2015, Nevada lawmakers followed suit, passing SJR 1 requesting a transfer of federal land to state control. Nevada became a state in 1864 through an act granted by Congress with conditions attached, NPRI says, to which other states were never subject, including the reservation of most land within the state’s boundaries for federal ownership. In 1865, the U.S. Supreme Court ruled, "the power of the United States over these lands as property was to cease." Nevada lawmakers concluded, "the attempted imposition upon the State of Nevada by the Congress of the United States of a requirement in the enabling act that Nevada ‘disclaim all right and title to the unappropriated public lands lying within said territory,’ as a condition precedent to acceptance of Nevada into the Union, was an act beyond the power of the Congress of the United States and is thus void." Nevadans have tried to regain control over public lands. In the mid‐1990s, Nevada lawmakers proposed amending the state constitution to remove the disclaimer of interest in public lands. Both chambers passed the measure, which went to the ballot in 1996, and gained 56.3 percent of voter approval. The amendment cannot become effective without the consent of Congress. "If Congress fails to comply with SJR 1, Nevada should pursue its legal remedy," NPRI argues. "Utah’s bill sets a hard deadline for Congress to transfer public lands, so the state will have standing to sue once the deadline has passed. Nevada, like other states, should similarly sue." According to a lands summary by the state of Nevada in 2015, the federal government owned 58,226,015.6 acres of the approximately 70,000,000 total acres in Nevada. Federal land is divided and overseen by the Bureau of Indian Affairs, the Bureau of Land Management (BLM), Bureau of Reclamation, Department of Defense, Department of Energy, Fish and Wildlife Services, Forest Service and National Park Service. During the 2013‐2015 legislative interim, Nevada’s Land Management Task Force calculated that state and local governments could net up to an additional $205.8 million annually by managing 7.2 million acres of BLM lands directly, or $1.3 billion annually by managing 45 million acres of BLM‐held land. New availability of land would prompt new development and job creation, NPRI says: "If Nevada could gain title to its own lands, it could generate massive public revenues through the sale or lease of those lands."